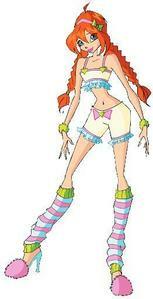 Uploaded by: WInxClubEnglish I don't take any credit for this video または its productions. WOW! Did あなた already watch the show? Enjoy the first episode of World of Winx and share your opinion... What do あなた like the most of this new series? This is Bloom in her pajamas. In what season did Bloom them? Winx Club:Season 4! Roxy's Fairy Transformation! Nick Dub! HD! Winx Club: The Shadow Phoenix: Trix Gloomix! HD!